The identity of Chosewood is blooming as the BeltLine development grows nearer. Atlanta has seen the BeltLine alter how people think about transportation and outdoor culture. Edible Neighborhood is changing the perception of how and where food can be harvested while adding value to community spaces in the city of Atlanta. Atlanta, GA, March 23, 2019 --(PR.com)-- Chosewood Park is perhaps the least known BeltLine neighborhood. And they have a big secret. The sidewalks are lined with fruit, herbs, and flowers. And now they are magnifying that with an unprecedented new planting of edible landscaping. Working in cooperation with the non-profit Bare Hands Bear Fruit, Inc., the neighborhood will be planting over 200 edible plants to expand the existing 100+ fruit trees, berry bushes, grape vines, and culinary herbs. In late 2018, Bare Hands Bear Fruit hired a part-time gardener to expand the program in Chosewood Park. Mike McCord is the owner of Community Foodscapes, a landscaping company dedicated to edible landscapes. “This program is a fantastic way to build community, provide fresh produce, and even cottage scale business for decades to come,” McCord said. The Edible Neighborhood program was started five years ago by real estate investor, Clay Preston. Preston’s investment group has renovated over 30 homes in Chosewood Park since 2008. In 2014, he started planting fruit trees in the front yards of their rentals. “This is different from the ‘food forest’ and community garden ideas. With Edible Neighborhood the fruit and herbs are planted along the sidewalk for all the neighbors to harvest,” Preston said. “Last summer, neighbors were sending out notices that they had more fruit than they could possibly use. More than they could turn into jam and jelly,” Preston said. “We even collected hundreds of apples and plums to take to food banks,” he added. On Saturday, the program will get turbocharged. 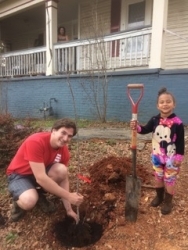 With McCord’s expertise and volunteers from all over the neighborhood the program will add dozens of new fruit trees, berry bushes, and culinary herbs across the neighborhood. Through funding obtained by Bare Hands Bear Fruit, the program has been able to donate all of the plant materials to any homeowner interested. “We are so excited about tomorrow. My two boys will have fresh produce outside our door as they grow up. They will learn about where their food comes from, about cooperating with community, and about generosity. And that begins tomorrow,” said Stephanie Scibilia, one of the neighbors hosting edibles. Edible Neighborhood is about growing in appreciation of the power and delight of nature, cultivated. They are looking to encourage people to grow food and community in all the space they have. The event will begin at 9:00 am on Saturday, March 23, 2019 at the Chosewood Park.